Thunderbird Thursday! VIDEO: Phase III, GLW STEAM Night, Equity Consortium, NF Winter Wonderment, JYMS Spring Fling and more! The Baraboo School District is working hard to keep the community informed on the District's upcoming April 2, 2019, referendum - PHASE III: Revitalize Jack Young Middle School. 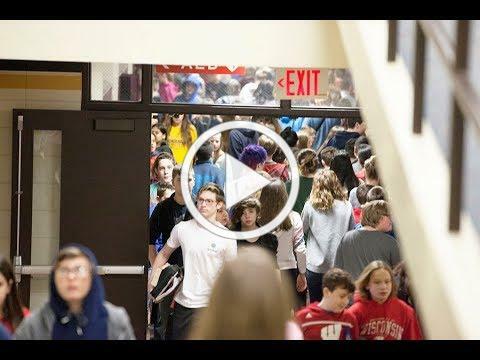 Please watch this short video, which gives an overview of the Baraboo School District's April 2, 2019, referendum, and receive important information on the District's proposed solutions to repair, modernize and expand Jack Young Middle School. This will be the first in a series of videos, so stay tuned for more information! Para ver la hoja de datos de la Fase III en espaÃ±ol, haga clic aquÃ­. March 14, 2019 marks the 31st anniversary of "Pi Day," so the North Freedom 5th graders decided to celebrate this national holiday in their classroom. First, they took a math adventure with the book Sir Cumference and the Dragon of Pi and created a "Pi City" using the digits of pi on a grid. With the hard work out of the way, they moved onto the most exciting part of the day: eating pie! Baraboo High School sophomore, Carter Stapleton, was recently awarded the rank of Eagle Scout, the highest and most honored rank in the Boy Scouts of America. Carter first joined the Cub Scouts as a Bear Cub in September 2011 and became a Boy Scout in March 2014, and since that time has held numerous leadership positions, became a member of the Order of the Arrow in July 2017 and has completed 31 merit badge awards. Carter's Eagle Scout Project consisted of building and placing picnic tables on the grounds of the Badger Steam and Gas Show in Sauk County, an annual event involving thousands of people. Carter's dedication to teamwork is not just limited to the Boys Scouts, but he has also demonstrated a strong commitment to his school and education, and actively participated in youth karate, soccer, baseball and wrestling and is now a member of the Baraboo High School cross country, wrestling, and track teams. On March 8, Representative Dave Considine presented him with a citation for his achievement. Congratulations, Carter! Check out what our 6th grade students did at Jack Young Middle School this week! JYMS 6th graders joined area middle school students at Crystal Grand to attend the "Make it Stop" Anti-Bullying Conference, and NBC15 was there to get the scoop. Watch the video to see how the students spent their day - and spot some of our very own students dancing in the background! West Students Awarded for Bee-ing Great! The West Kindergarten Center continues to reinforce positive student behavior with students in different ways each day. We recognize Aja Brickl, Thomas Milestone, Willa Stevenson and Ella Karg for this week's BEE Great Award at West. These students have truly exemplified the West Cool Tools of "Being Respectful, Being Responsible, and Being Safe"
Each week, West staff will continue to recognize a different student from each classroom for this awesome recognition. Thank you to our families for all of their continued positive support at West. On Friday, March 8 th , North Freedom students spent part of the afternoon participating in "Winter Wonderment." For several weeks prior, students reviewed their PBIS Cool Tools and had a "Snowball Challenge." For every ten gold tickets students received, they earned a snowball that was displayed on the bulletin board in front of the school. Kindergarten won the challenge and received an extra classroom reward! As a way to reward students for all of their efforts, students participated in "Winter Wonderment" where they rotated through fun stations including Snowman Bowling, a Marshmallow Challenge, a Prairie Run, an outdoor Survival Course, and a Bean Bag Toss. It was a fun way to end the day on Friday and just in time before the snow started to melt! East School is holding a March Madness Kindness Challenge to encourage fun and kindness in school, home and out in the community. Grade levels are competing to earn Kindness Tickets each week in the month of March. Students are also independently working on a Kindness Bingo board at home and will return them to school for a Kindness Certificate. The March Madness Kindness Challenge is promoted through East School Kindness Club. The Summer Academy registration for current K-5 students will begin online at 10 a.m. on Friday, March 15. Please see our 2019 Summer Academy Course Descriptions & FAQ. District Administrator Dr. Lori Mueller and Baraboo High School students Phillip Zolper, Destina Warner and Jordan Blue were specially invited to attend the Dane County Equity Consortium in Monona Grove this week. The students, along with 14 other school districts, collaborated to create a student-led conference for student leaders on topics of equity and social justice. The conference is slated for April 29. Approximately 20-25 students from BHS will attend and participate. These students will return from the conference with a student-driven action plan to address issues of equity with their peers. Jack Young Middle School's Student Council is sponsoring activities to help their classmates and teachers get through the last days of winter and welcome spring with a Spring Fling. Students have been participating in a series of dress-up days, including 80's Day, Twin Day and Favorite Sports Day. There will also be a "March Madness" Dance and basketball shoot-out on Friday, March 22 from 5:30-8:00pm for JYMS students. Students may arrive from 5:30-6pm and leave from 7:30-8pm. Entry is $5 and concessions will be available. North Freedom 4th grade student Kessie Breitbach won 4th place in her age group in a state-wide art contest entitled "My Dream to Fly." In her painting, Kessie used watercolors and oil pastels, applying a technique she learned from Ms. Nolden in art class. Her work will be displayed at the state capitol from June 21st - July 5th, 2019. Gordon L Willson Elementary and West Kindergarten Center held its STEAM Night on Thursday, February 7th. This year featured STEAM activities and challenges to promote science, technology, engineering, arts, and mathematics. There will be an informational meeting for students in grades 7 and 8 who would like to participate in Girls Softball or Co-ed Track & Field at Jack Young Middle School. The meeting will be held on Monday, March 18 at 5:30 p.m. in the JYMS Auditorium. Parents should register their child for the sport on the Parent Portal on the school district website prior to the meeting, or arrive by 5:00 to register that night. Private school and homeschool students living in the Baraboo School District boundaries are encouraged to participate in JYMS Athletics. The season begins on April 1. Please e-mail kcatterson@barabooschools.net if you have any questions.